Since the beginning of 2017, Vela has released four new destinations on its SREX market access product. SREX offers a normalized API that allows for fast integration in order routing applications. Leveraging the normalization and a mature process to update the functionality when new Exchange Driven Changes (EDCs) are published reduces the TCO of trade flows to multiple venues. SREX supports access to liquidity pools in the Americas, EMEA, and APAC as well as multiple asset classes (Equities, Fixed Income, Foreign Exchange and Commodities). 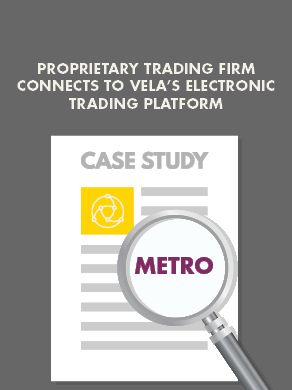 With the new destinations, Vela offers market access software for more than 115 venues globally through one normalized API that abstracts from the exchange protocols. *SQF (Specialized Quote Interface), CTI (Clearing Trade Interface), and OTTO (Ouch To Trade Options) allow access to ISE on the Nasdaq platform. All new market access venues are available immediately. For any questions or issues, please contact your Vela Account Manager or reach out to the account management team via email at accounts@velatradingtech.com. For any technical or support queries, please contact the Vela support team at support@velatradingtech.com.